Among the causes for periodontal (gum) disease are genetic susceptibility, smoking, medications and other illnesses, like diabetes. Periodontal treatment involves removing plaque and tartar from above and below the gum line. Most gum disease is preventable with proper oral hygiene. However, what can start out as gingivitis (inflamed or bleeding gums) can quickly turn into periodontitis. In such cases, gums pull away from the tooth to create “pockets”, thereby exposing a dental root to infection. It can also lead to prolonged bad breath, loose teeth, painful chewing and other complications and serious health issues, such as heart disease and cancer. Periodontal disease and gingivitis occur when bacteria from plaque colonise on the gingival (gum) tissue, either above or below the gum line. These bacteria colonies cause serious inflammation and irritation, which, in turn, produce a chronic inflammatory response in the body. As a result, the body begins to systematically destroy gum and bone tissue, making the teeth shift, become unstable, or completely fall out. The pockets between the gums and teeth become deeper and house more bacteria which may travel via the bloodstream and infect other parts of the body. Appearance – Observe gum health and calculus presence. Probing – By measuring the depth of the gum pocket around the tooth, we can assess the extent of infection and the treatment required to resolve it. Normal gum pockets should be in the 1-3 mm range. X-Rays – X-rays enable us to look under the gums to examine the level of bone support and calculus presence. Bone is the structural support of teeth and its loss can compromise the long term life of teeth. X-rays provide us with a view that helps us personalise a plan to stop bone loss and treat deep seated gum problems. Home Care – Determine the level of home care: Is the patient brushing twice daily and flossing daily using an effective technique, along with having regular hygiene appointments? Gingivitis – When bacteria containing plaque collects around the necks of your teeth, the adjacent gum reacts with increased blood flow to ward off the invading bacteria. If the plaque is not removed via daily cleaning, an infection develops in the gum that leads to puffy, swollen areas that bleed on brushing or flossing called Gingivitis. Periodontal Disease – If the untreated gum infection reaches the deeper areas of the tooth, it is not accessible to brushing and a deep seated infection develops that can lead to bone loss (Periodontal Disease). This bone loss affects the foundations of the teeth and can lead to ultimate loss of the tooth if untreated by your dentist. Bone Loss – Bone loss is the result of uncontrolled and untreated gum infection. It may lead to tooth loss if not treated, but can be diagnosed by regular attendance with your dentist and hygienist and with the assistance of x-rays to assess the levels of bone support. Once diagnosed, your dentist or hygienist can recommend the necessary treatment to restore health to the foundations of your teeth. Tartar removal – Tartar (calculus) and plaque buildup, both above and below the gum line, can cause serious periodontal problems if left untreated. Even using the best brushing and flossing homecare techniques, it can be impossible to remove debris, bacteria and deposits from gum pockets. The experienced eye of a hygienist using specialised dental equipment is needed in order to spot and treat problems such as tartar and plaque buildup. After completing periodontal treatment (perio scaling), periodontal maintenance is recommended every three to four months. Research indicates bacterial formation on teeth and gums occurs almost immediately after the cleaning, with bad bacteria forming after 3 months. Frequent removal of the bacteria from under the gumline can control the inflammation and can often prevent the further breakdown of the bone and gums supporting your teeth. Though gum disease cannot be completely reversed, periodontal maintenance is one of the tools the hygienist can use to effectively halt its destructive progress. Why not get in touch with us today? When it comes to the very best Whangarei Periodontal Treatment, we pride ourselves on reliable staff and trusted expertise. Periodontal disease, in simple terms, is a gum infection. The infection of the gums can be as mild as just red puffy gums that bleed easily when brushing or flossing to a serious loss of supporting bone tissues in response to the infection. Periodontal disease can lead to many other health related conditions such as heart disease, stroke or Alzheimer’s. Also, other health conditions such as diabetes or cancer can also affect the severity of periodontal disease. The mild version of periodontal disease is called gingivitis while the more serious version is called periodontitis. Gingivitis is usually the first stage of periodontal disease and if left untreated will develop into the more serious version, periodontitis. However, periodontitis can develop without having gingivitis first. In literal terms, gingivitis means inflammation of the gums. This condition is diagnosed by gums that bleed easily, are red in colour and have a puffy appearance. Gingivitis is completely reversible when treated early. Gingivitis is caused by prolonged exposure to bacteria by the gums. Bacteria live everywhere in the mouth and are constantly trying to build a protective layer for themselves called plaque. Plaque is easily removed by brushing and flossing when it first forms. After 24 hours, plaque starts to harden on teeth surfaces into tarter, otherwise known as calculus, which cannot be removed by simple brushing and flossing. A dentist or hygienist is required to remove these deposits which will allow the gums to heal back to a normal state as if nothing has happened. The best treatment for gingivitis is prevention. Properly brushing your teeth at least twice a day, flossing daily and regular visits to the hygienist will keep gingivitis away. However, once gingivitis has developed due to prolonged exposure of the gums to bacteria, they become tender, bleed easily and are red in colour and require the services of a hygienist to correct. The hygienist can remove the deposits that cause gingivitis with the use of special scaling instruments. Local anaesthetic is frequently used for treating gingivitis since the gums are tender from the inflammation. Once numbed, the hygienist will use an ultrasonic scaler and hand scaling instruments to remove the bacterial deposits above and just below the gum line as well as any infected gum tissue. An ultrasonic scaler is an instrument with a metal tip that vibrates at a high frequency that breaks up the hard deposits on the teeth. Once free from deposits, the hygienist will polish the teeth with a gritty pumice paste to leave them smooth and shiny. Now that the gums are free from bacteria, they will heal back to their normal pink and firm state with no evidence of gingivitis. However, it is up to you to keep them clean with proper home care and regular visits to the hygienist at least twice a year. Your hygienist will help determine your maintenance schedule based on health and lifestyle factors as well as dental work present in your mouth. 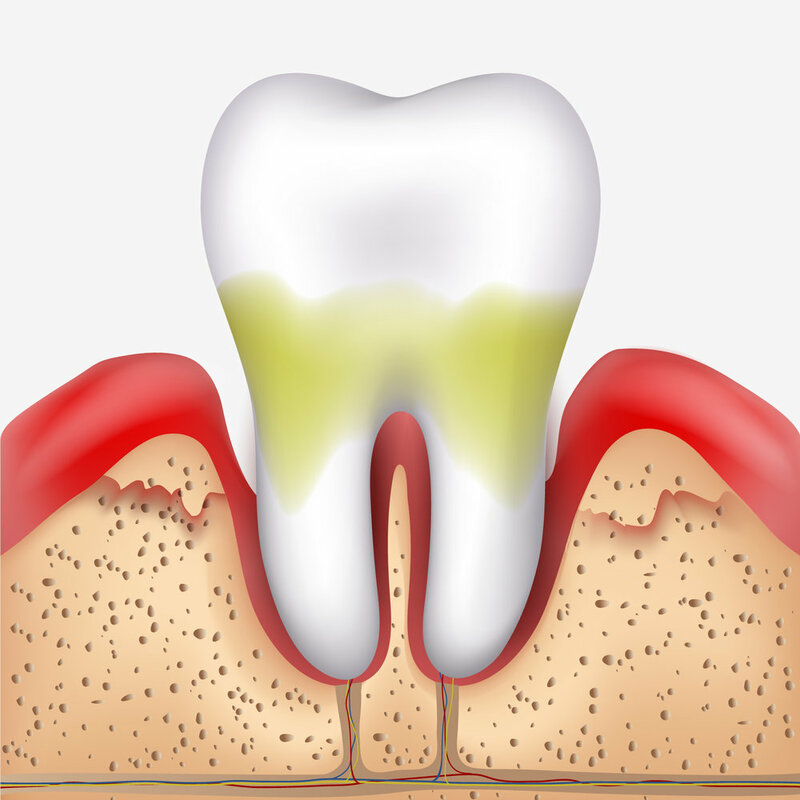 Periodontitis in literal terms means inflammation around tooth structure. The structures around a tooth are the gums and bone that hold the tooth in place. The body’s response to bacteria, actually the toxins released by bacteria, is inflammation. The inflammation process is the body’s defence mechanism against the invasion of bacterial toxins trying to enter the body. Inflammation is the accumulation of a certain type of defence blood cell that will dissolve any toxin into a harmless state. Unfortunately, the inflammation also dissolves parts fo the body as well. And in the case of periodontitis, inflammation dissolves the supporting structures of the tooth, meaning the gems and bone around the tooth. 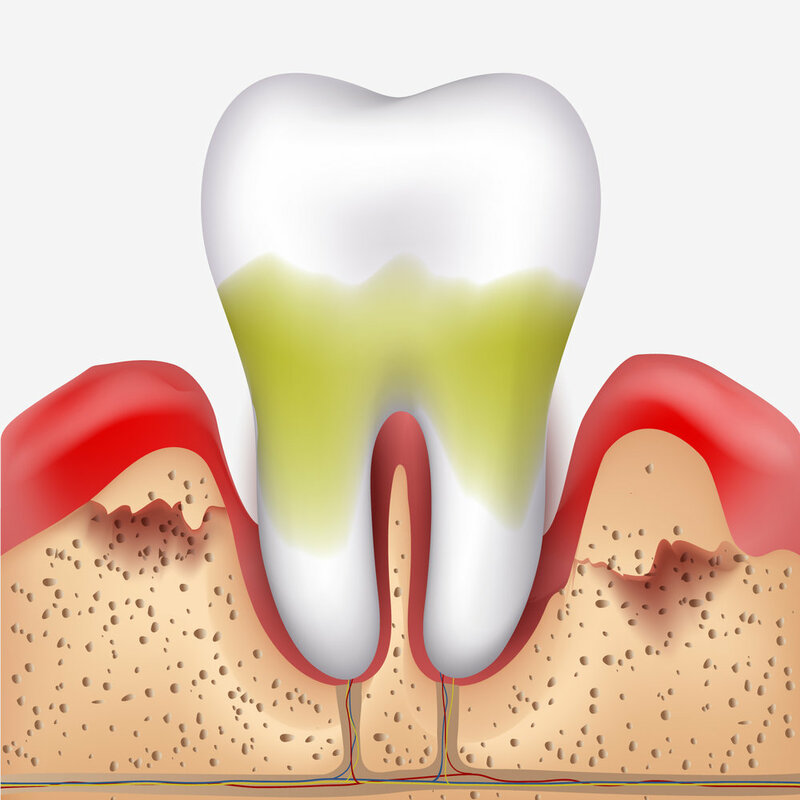 As the bone is dissolved away, more and more bacteria build up deposits deeper and deeper onto the roots of the tooth. As the bone disappears, the tooth becomes loose and is eventually lost. Your dentist will determine if you have periodontitis by taking x-rays to see the level of bone around each tooth as well as take measurements around each tooth to determine the distance from the edge of the gum to where the gum is attached to the tooth, also known as the gum pocket. This measurement is known as the pocket depth and is measured at six points around each tooth. The measurements are in millimetres with a normal measurement no greater than 3mm. Measurements beyond 3mm indicate active, or a history of, periodontal disease. If there is bleeding or pus coming from the gum when taking the measurements, the periodontal disease is active. This is known as bleeding on probing or BOP. If there is no bleeding or pus, then the disease is dormant and means you are doing a great job of keeping the pocket clean. You can tell if you have periodontal disease if you notice bad breath, loose teeth, spaces developing between your teeth, bleeding when brushing or flossing as well as pain. Most people with periodontal disease have red swollen gums as well. Periodontal treatment is performed on patients who suffer from periodontal disease. As bacteria live under the gums, they emit waste products which slowly harden on surfaces of teeth and roots of teeth. These deposits continue to grow on the surfaces causing increased damage to the supporting structures of teeth. The goal of periodontal treatment is to remove the bacterial deposits and any damaged tissue as a result of inflammation. The deposits are very hard to remove and requires special instruments to scale the deposits from the tooth surfaces. The deposits are similar to sea coral, very hard with little pores for bacteria to reside. The process of removing the deposits is similar to scraping paint off a metal tube. What types of periodontal treatment are there? There are many types of procedures available to treat periodontal disease. There are surgical and non-surgical methods of periodontal treatment, all with the same objective, that is to remove the bacteria and associated toxins from under the gums. The advantage of periodontal surgery is that the dentist can see all infected roots and effectively remove bacterial deposits on the teeth. The surgical approach also heals with smaller packets around the teeth making home care much easier. There are some drawbacks to the surgical approach which include increased tooth sensitivity, longer looking teeth and the fact that it is expensive. The procedure itself is quite invasive which has more healing pain than non-surgical techniques. The non-surgical techniques of treating periodontal disease involves scaling around each root surface of the tooth with special instruments with the use of local anaesthesia. The name for this treatment is called sub gingival curettage and root planing. The non-surgical approach is also known as soft tissue management or STM. A gum specialist (periodontist), dentist or dental hygienist can perform these treatment and is usually considerably cheaper than periodontal surgery. The advantages of the non-surgical approach include less costly, faster recovery time, less pain after treatment and little shrinkage of the gums to preserve normal tooth height appearance. However, the practitioner must rely on feel to determine if all bacterial deposits are removed when using the non-surgical method. When an area of the tooth has not been cleaned thoroughly, proper healing may not be complete and further treatment may be necessary. Soft tissue management is a regime that can last for years. Effective results depend on regular maintenance visits and scrupulous home care. There is a new player on the dental scene for periodontal treatment. This new method is called Perioscopy®, which involves a tiny camera inserted between the tooth and gum exposing the roots of the teeth so they can be cleaned of all bacterial deposits. Perioscopy® has been shown to be just as effective as periodontal surgery in periodontal treatment without any of the unwanted side effects. It is also much cheaper than periodontal surgery and can be performed by a periodontist, dentist or dental hygienist. Our office is fortunate to have one of the few Perioscopy® practitioners in New Zealand to offer this type of revolutionary periodontal treatment. If you have the early version of periodontal disease, gingivitis, then it is completely curable. Gingivitis does not destroy any of the supporting structures of the teeth and will leave no sign after treatment. However, it will return without proper maintenance of brushing, flossing and regular visits to the hygienist. Periodontitis on the other hand is not curable. The best you can hope for is to control periodontitis. Since periodontitis has destroyed some of the supporting structures of the teeth, the affected teeth no longer have the same defence mechanism against the invasion of bacteria. As of today, there is no way to reverse the lost supporting structures of teeth from periodontitis. However, you can still enjoy a long happy life with your teeth after periodontitis by visiting your hygienist regularly and performing diligent home care tactics. You may have to use special devises, such as interdental brushes or special floss to help keep your teeth free from bacteria. What happens if I don’t get periodontal treatment? If you have been diagnosed with periodontal disease, the earlier you treat it, the less damage results from the bacteria living under the gums. Each day, more and more bone is dissolved away by the inflammatory reaction to the presence of bacteria and their toxins. When you were 16 years old, the amount of tooth embedded into the bone is about 2/3 of the tooth’s overall length. This means 1/3 of the tooth is sticking out of the gums (the crown of the tooth) which is what you see in your mouth and the other 2/3 of the tooth is embedded into the bone. This 1:2 crown to root ratio is what makes teeth solid. If you lose 3-4mm of bond around a tooth or teeth, the crown to root ratio becomes more like 1:1 where an equal amount of tooth is sticking out of the bone and into the bone. This ratios is becoming less desirable and teeth start to move more when you bite or eat. As the tooth wriggles in the bone under function, the gap between the tooth and the bone becomes larger and easier for bacteria to move into. This is why periodontal disease starts slow and then rapidly destroys a mouth if left untreated. The ultimate fatality in untreated gum disease is tooth loss. However, since periodontal disease contributes to heart disease, Alzheimer’s and strokes, losing a tooth would be the lease of your worries. Perioscopy® is a method of treating periodontal disease. A tiny camera is used by the hygienist or dentist to see the root surfaces of the teeth. The ability to see under the gums without surgery is revolutionary. Perioscopy® consists of a fiber optic cable with a light on one end and a camera on the other. The camera is connected to a computer monitor for the practitioner to view. The fiber optic cable is inserted between the tooth and gum which shows an image of deep under the gums on the monitor. The practitioner can then use hand scaling instruments and ultrasonic scalers to remove those deposits under the gums, which can prevent the need for expensive and invasive gum surgery. Local anaesthetic is used for all periodontal treatment methods so you won’t feel a thing while the treatment is performed. What you will feel is the healing and recovery after the numbness has worn off. The type of treatment you receive will have an impact on the recovery experience as well as the discomfort tolerance of the individual. The amount of infection present before treatment also impacts post treatment recovery. Surgical periodontal treatment will most like have the greatest discomfort after treatment as the gums have a lot of healing to do. Perioscopy® and non-surgical periodontal treatment will be far less painful after the procedure. If you keep up with your scheduled maintenance and home care, then you should not have any discomfort after routine maintenance procedures. Why are my teeth sensitive after periodontal treatment? Your teeth may not be sensitive before periodontal treatment but become very sensitive after. This is because the roots of the teeth are covered in bacteria and deposits which have been insulating the feeling part of the tooth (the root). Once the layer of bacteria and deposits are removed from the roots of the teeth, they can now feel changes in temperature which we perceive as sensitivity. The most common sensitivity after periodontal treatment is sensitivity to cold. However, some people are sensitive to hot foods and drinks as well as certain types of foods. Acidic foods, like citrus fruit, pineapple and kiwifruit are common culprits. What can I do to stop teeth sensitivity after periodontal treatment? Once your have received periodontal treatment, you teeth are now clean and healthy. Over time, your body will add a healthy insulation layer from saliva. This can take months to occur and even longer if you frequently expose your teeth to a high acid diet, like citrus fruit. There are special toothpastes available that can help the body build a new insulation layer on the roots of the teeth. It may take a couple fo weeks for the sensitive toothpaste to work. The sensitive toothpastes are available at the grocery store or chemist. Ask your dentist or hygienist for more information. They might even give you a sample!